It is with regret that we have taken the responsible decision to postpone the 2019 World Snooker Federation Championships. It was disappointing that at this late stage the UAEBSA were unable to host us, however in order not to let down players and officials, the WSF board and management team took immediate action and formally secured an alternative location and date in just a few days. We must thank the China Billiards & Snooker Association (CBSA) for their offer of assistance in this matter. Having reviewed this alternative plan and consulting with federations and partners, it is clear that a number of players may suffer due to travel arrangements and late visas. With this in mind, we feel it would not be appropriate to stage such a prestigious global event without a full international field of entry. We have therefore decided not to proceed with the event at this stage. The WSF has become a large network for snooker and billiards development and is working to support many projects in regions around the world. World Snooker Tour Qualification is already being earned through WSF membership in the European Championships, Pan American Championship, Africas Championship and Oceania Championship. World Snooker Tour places are also granted to the CBSA through their national tour. Further playing opportunities are also being developed through WSF member regions and national federations. We are excited to be the supporting partner to the African Billiards & Snooker Confederation for snookers inclusion in the 2019 African Games, something which can only be described as a landmark achievement for our sports globalisation. The official 2019 World Women’s Snooker Championship, part of the World Women’s Snooker Tour will continue to be staged in the next few months. Further opportunities will be available for federations to nominate players for this event and venue details and dates will be communicated to you soon. Danish cueist Daniel Kandi won the Nordic Snooker Championship for the first time last weekend at the Snookerhallen in Stockholm, Sweden. ​The annual event, organised by the Nordic Billiard Council (and this year hosted by the Swedish Billiard Federation), features players from all five Nordic countries. As with previous editions, Denmark, Finland, Iceland, Norway and Sweden each sent eight representatives to the 40-player tournament. Split into eight groups of five, the top two from each round robin qualified for the last 16 straight elimination phase. Every country had a player in each group. Kandi, who won the 2018 Danish National Championship making a 147 maximum break along the way, finished top of group 8 after winning all four matches and dropping just one frame. He then dispatched Finnish pair Janne Häkkinen (4-1) and Antti Tolvanen (4-2) in the last 16 and 8 respectively. In the semi-finals Kandi made a half century break in each frame as he ended the defence of 2018 champion Belan Sharif (Sweden) with a comfortable 4-0 victory. It meant some revenge for Kandi having lost to Sharif in the final twelve months before. His opponent in this year’s final was another one of the pre-tournament favourites, Patrik Tiihonen, the 2017 runner-up. The Finnish teenager topped group 6 with three wins out of four and relinquished just two frames when denying Timo Salovaara (Finland) 4-1, Jim Johansson (Sweden) 4-1 and Mats Eriksson (Sweden) 4-0 afterwards. 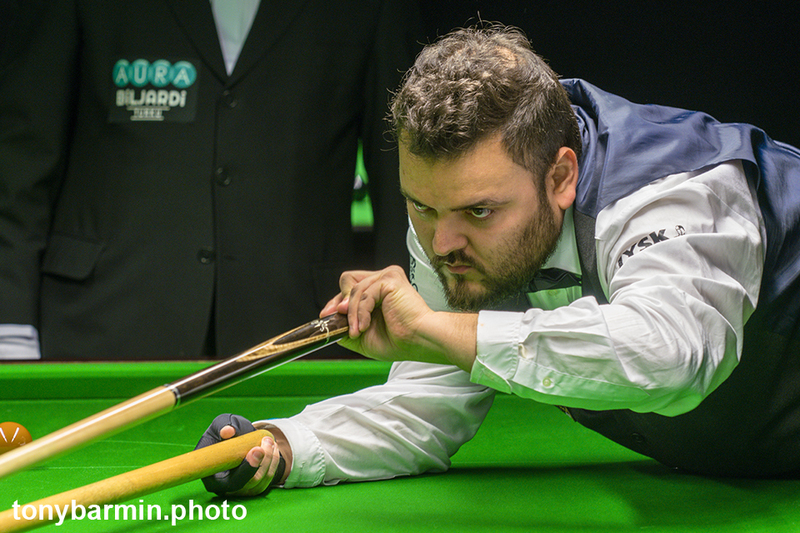 Tiihonen made a positive start to the best-of-nine frames final when he took the opener with the help of a 68 break, however Kandi chalked up the next three to go 3-1 up at the mid-session interval. On resumption Tiihonen squared the match at 3-3 (60 break, frame 6). Kandi then moved onto the hill after a run of 75, but the younger of the pair forced it all the way when securing frame 8. In a close and dramatic conclusion, Tiihonen held a small advantage in the decider but failed to pot one of the four remaining reds. It would be his last shot as Kandi kept his nerve with a gutsy break of 42 as he won on the final pink. ​Kandi, a competitor at 2018 Q-School in Burton, pocketed 1,000 Euros, whilst Tiihonen received 500. Semi-finalists Sahrif and Eriksson each banked 250. To see the full results, please either visit cuetracker.net or here. The final is available to watch in full at YouTube. Article originally written by Michael Day for The Cue View. It has been announced by the African Billiards and Snooker Confederation (ABSC) that snooker will be included at the African Games for the first time later this year, representing a landmark development for our sport in the region. Now organised by the Association of National Olympic Committees of Africa (ANOCA), the African Union (AU) and the Association of African Sports Confederations (AASC), the African Games were first staged in 1965 with approximately 2,500 athletes from 30 countries taking part. The 2019 Games represent the 12th edition of the event and will take place from 20 August – 1 September in Casablanca & Rabat, Morocco. 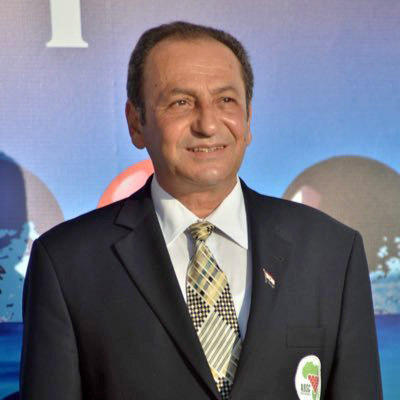 The decision to include snooker as a medal sport for the first time comes following significant work undertaken by the ABSC and in particular its president Mohammed El-Kammah who has worked tirelessly to make this dream become a reality. It has been confirmed that member countries of the ABSC will be eligible to nominate players to compete at the Games. Non-member countries are therefore encouraged to become members of the ABSC so that as many people as possible will have the opportunity to pick up a cue and ensure that snooker is strongly represented in Morocco. Among the most successful players to have emerged from the region include South African Perrie Mans, who reached the final of the world championship at the iconic Crucible Theatre back in 1978, losing 25-18 to Ray Reardon. Other players to make an impact at this time were former British Open champion Silvino Francisco and his nephew Peter, who rose as high as 14th in the world rankings and more recently competed at the World Games in Wroclaw in the summer of 2017. Egypt’s Basem Eltahhan was the winner of the African Snooker Championship in 2017 and currently competes on the professional circuit, notably coming close to causing an upset against Mark Selby in the opening round of the UK Championship during his debut season before losing 6-4. Jason Ferguson, WPBSA Chairman said: “Any true global sport should reach out to every corner of the word to create opportunities for all. This is the true meaning of sport and is a further demonstration of development in cooperation with the WPBSA Group and the World Snooker Federation membership. Further information will be released here by the ABSC in due course. 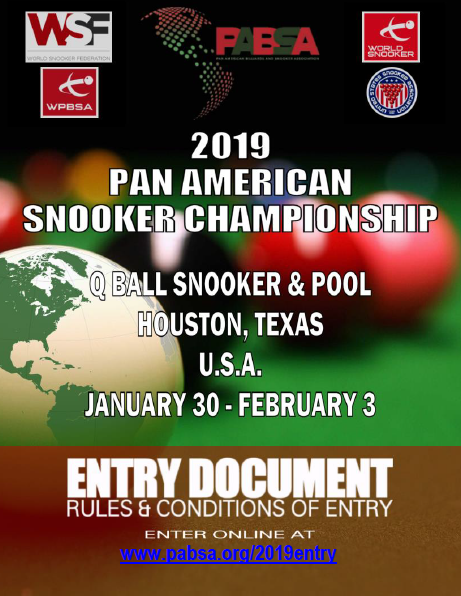 The 2019 Pan American Snooker Championship will come to the United States, as the newly formed Pan American Billiards and Snooker Association (PABSA) will host this prestigious international snooker event at Q Ball Snooker & Pool in Houston, Texas, from January 30 – February 3. The competition will have the top 48 players from North and South America including former professionals from the region. It will be spearheaded with players such as Igor Figueiredo and Itaro Santos, will also have pool professionals including Corey Deuel participate in the competition. Top players from Canada, USA and Bermuda will also be competing to win the prestigious Pan American snooker championship. The Championship will commence just days after the conclusion of the 2019 World Seniors Snooker Championship qualifying event at Q Ball Snooker & Pool, giving those eligible players the opportunity to compete in both competitions. PABSA will also be holding regional billiards event, the first of it that will be held in Winnipeg, Canada in May of 2019. Women’s and Masters events will be held from 2020 as a part of the Pan American Championships. Prior to the Championship, PABSA will hold their first meeting, and it is anticipated that Jason Ferguson, the chairman of both the World Professional Billiards & Snooker Association (WPBSA) and the World Snooker Federation (WSF), will be present. Yesterday saw the successful opening of the Malta Snooker Academy situated at the Maria Assumpta School, Hamrun. 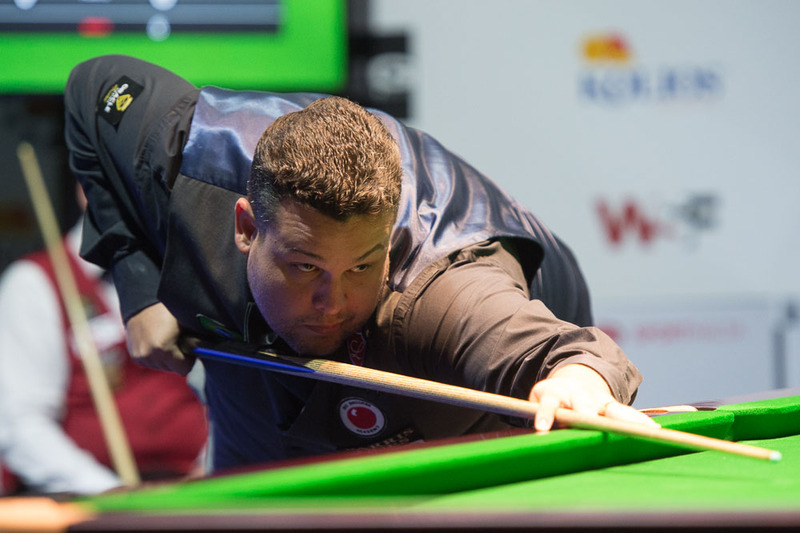 The Academy is the result of a successful project launched by the Malta Billiards and Snooker Association with the support of the World Snooker Federation (WSF) and World Professional Billiards and Snooker Association (WPBSA). The launch follows the first staging of the WSF Championships in St Paul’s Bay back in March, with seven of the tables used at the tournament now installed at the academy and an eighth planned for future use. 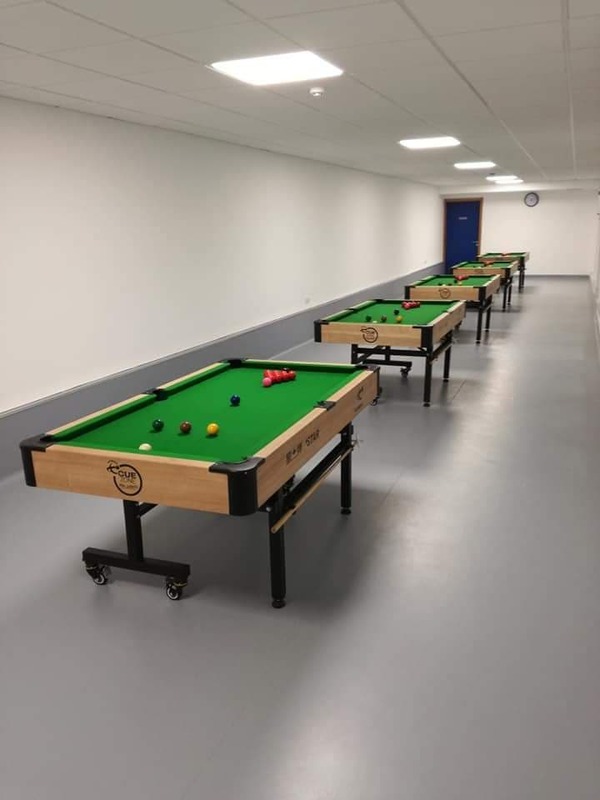 The Academy also houses five ‘Little Star’ tables donated by the WPBSA to encourage future development, with all future Maltese divisions and ranking events set to be played at the venue. The Academy is a fantastic legacy of the WSF Championships and the WSF team would like to wish everyone in Malta the best for the future. Billiard sports launched its bid to become part of the Paris 2024 Olympic Sports programme today at a special ceremony at the Eiffel Tower in Paris. 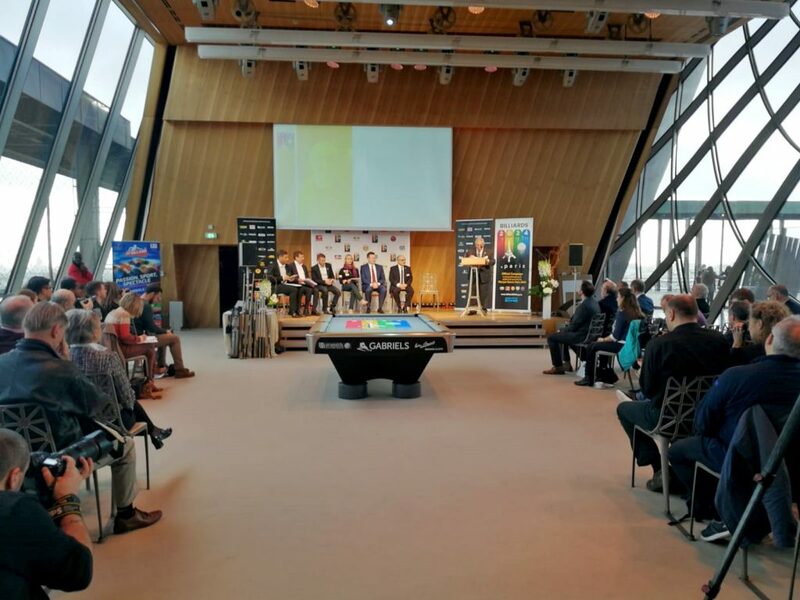 Hosted by the Billiards 2024 Committee and supported by the World Professional Billiards and Snooker Association (WPBSA) and World Snooker, the event represents a significant milestone billiard sports’ bid for inclusion at the Paris 2024 Games. Among those present were WPBSA Vice Chairman Nigel Mawer QPM and former world professional snooker champion Shaun Murphy, who joined senior representatives from the Fédération Française de Billard (FFB) and other international organisations to support the bid. Billiard sports previously applied to join the Olympic programme for the Tokyo 2020 Games and three years on is in a significantly stronger position to be successful as cuesports continue to grow globally. The first step to securing Olympic status for 2024 was taken earlier this year by the World Confederation of Billiard Sports (WCBS), the umbrella organisation representing snooker, pool and carom billiards, when the formal submission for billiard sports to be included as an additional sport at the Paris Games was made with the full cooperation of the FFB. Snooker in particular has a proven track record of staging high-quality international events with the World Snooker Tour now comprising 27 major tournaments around the world, with a television reach of 1.6 billion homes. The sport is played in approximately 100 countries with players from across the globe regularly participating. The sport is strongly represented at both professional and amateur levels and under the guidance of former WCBS President Jason Ferguson and former General Secretary Maxime Cassis, was successfully included at the 2017 World Games in Wroclaw at which leading professional Kyren Wilson of England won the prestigious gold medal. Snooker’s International Federation the World Snooker Federation (WSF) has since brought together professional and amateur bodies, including women’s and disability organisations, providing opportunities for all to compete on the same field of play. Following today’s announcement of the bid, next year will see a further demonstration event staged in Paris which will showcase the Olympic values of billiard sports.